Lifel1k3 (2018. 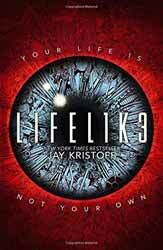 398 pages) is the first in a new science fiction series, written by Jay Kristoff. This is a young adult novel, so be warned the book contains author created slang. The title may be a bit confusing as this is the first novel, in the series and not the third. The book is a light read which borrows many tropes from previous novels and films. Eve’s world consists of what is left after a nuclear exchange, the action centred on the remains of California. This is a very different place, a place of religious zealots, always on the lookout for any genetic abnormalities. If they are found, the unlucky people are crucified. It’s your usual post apocalypse scenario, with heaps of metallic scrap left over from the war. It is from this scrap that Eve makes her robots to fight in the Wardome. This is a world which has perfected many wonders, intelligent robots and androids and biomechanical behemoths which swim the ocean mining its rare minerals. It is also a hard place to survive unless you belong to the elite, the corporations which have replaced the government. Eve’s friend, Lemon is engaging, sassy and brave and as a character is probably more interesting than Eve. Of course, as these things are wont to do, there is a mystery at the heart of the novel, but to honest, given the title and Eve’s deliberate nomenclature, if you don’t work out the mystery by the time you have gotten about a third way through the book, you are not reading enough stories. The arrival of Ezekiel, and subsequent arrival of another android, Faith, apparently intent on doing Eve harm, sets Eve, Lemon, Ezekiel and their two droids off on a road trip to discover a truth which is glaringly obvious. It’s not a bad book, but it’s difficult to say that it brings anything radically new to the genre. We have seen these desolate landscapes in anything from Tank Girl, to whom Lemon owes much for her personality, Waterworld, to Mad Max and the idea that the world is all a little pants now. Some characters are more engaging than others, but that is going to be very much a matter of the reader’s tastes. So, without the mystery really being that hidden, we are left with a female-buddy road trip, which is ok as far as it goes, but hopefully Kristoff will be able to expand the world in later novels.